This page provides a selection of Hubert Lamb’s discussions of the issue of man-made climate change. The page will be corrected and improved as time permits. Please check the original source before citing. Discussion of the validity of Lambs views is avoided but welcome in the comments. Most often we hear that the science is simple and that there is a consensus about the warming effect of increases in carbon dioxide and other greenhouse gases in the atmosphere. The first volume of Climate, Present Past and Future, which Lamb wrote while still at the Met Office, considers the fundamentals of climate. It includes some discussion of the greenhouse warming hypothesis, but it does not find the physics so simple. It is…abundantly clear which substances in the atmosphere operate chiefly to absorb part of the incoming solar radiation (e.g. oxygen and ozone) and which have their chief absorption within the spectrum of outgoing terrestrial radiation, on which they therefore have by far the greatest proportionate effect (e.g. carbon dioxide and water in vapour or liquid form). The carbon dioxide content of the atmosphere is believed, from comparison with such measurements as were made around 1890-1900, to have increased from about 290 ppm about that time to about 315 ppm by 1960, due to the increased burning of fossil fuels, chiefly coal and oil. The increase was 5% by 1944, 10% by 1967. The CO2 is apparently evenly mixed throughout the atmosphere (constant ‘mixing ratio‘), except near local sources and close to vegetation. The concentrations quoted mean that the total carbon dioxide present is equivalent to a layer of this gas at the surface 2.5-2.8 cm thick. This is more than enough to absorb all radiation between 4.0 and 4.8 µm, and enough to absorb about 40% of the radiation at wave lengths between 14 and 16 µm. In the absence of water vapour, the carbon dioxide at present in the atmosphere would absorb 15-20% of the total energy emitted from the Earth. Water vapour is, however, a still more effective absorber of radiation on most of the same wave lengths as CO2, and indeed together they appear to absorb all the terrestrial radiation on wave lengths greater than 14 µm. So it seems that changes in the amount of carbon dioxide in the atmosphere can only affect wave lengths in the CO2 band about 4.3 µm and between about 12 and 14 µm, for which wave length absorption by water vapour is incomplete. In the stratosphere, where the quantity of water vapour is very small, absorption by carbon dioxide just over a narrow band about its maximum at 14.7 µm exceeds that by water vapour. Absorption curves reproduced by Shaw (1930) and Plass (1954) indicate that, in the absence of water vapour, the carbon dioxide in the atmosphere would absorb all the radiation between wave lengths 12.5 and 17.5 µm emitted by the Earth’s surface (taken as having an effective, or overall mean, temperature of 288oA). This main absorption band alone accounting for 14% of the Earth’s emission. In fact, however, the water vapour present absorbs in the lower atmosphere almost all the radiation between those wave lengths emitted by the surface wherever temperature is over 283oA (Callendar 1960) and its re-radiation returns much of this to the Earth; so the influence of CO2 must be limited to the colder, drier climates and seasons, and to higher levels in the atmosphere. Some authors have held that long term variations of the amount of CO2 could make a difference of up to 1% more or less of the Earth’s surface emission of long-wave radiation being absorbed in the atmosphere; others rate the effect much lower. Plass (1956) estimated that doubling the present CO2 content of the atmosphere should raise world temperatures by 3.6oC and believed that the observed 1oC rise from the industrial revolution to 1950 could be accounted for by the undoubted increase of CO2; others (e.g. Matthews 1959) believe that the effect could, at most, have been a quarter of this, Manabe and Wetherald (1967) put it at just half Plass’s figure. Probably over most of the Earth the water vapour and carbon dioxide together already more than suffice to absorb all the radiation emitted on the wave lengths concerned. This point, and any future changes, might be sealed by observations of the spectrum of Earth radiation from satellites. The observed decline of global temperature since 1945 implies some other factor exercising about three times as strong an effect (in the opposite direction) as the CO2 increase. Man’s estimated present output of 9 x 109 metric tons per year of CO2 from burning fossil fuels is not, however, all retained in the atmosphere. The oceans are a great reservoir of CO2, holding about twenty-seven times as much of it as the atmosphere. Moreover, as the concentration in the oceans increases, more CO2 becomes fixed as calcium bicarbonate in the deposits of the ocean bed. The vertical circulation of the oceans is slow and when there is a change in the amount of CO2 in the atmosphere, it probably takes 10 000—50 000 years before a new equilibrium is attained between these three reservoirs. Moreover, the exchanges are complicated by the difference in the solubility of CO2 at different temperatures: the oceans tend to give off CO2 when they are warm and dissolve more when they are cold. J. Murray Mitchell (unpublished lecture at the American Association for the Advancement of Science symposium on environmental pollution 1969) estimates that the amount of CO2 in the atmosphere by 1980 will be 15%, by 1990 20%, above the 1890 concentration. The complicated relationships involved in the heating of the surface and heating of the Earth-atmosphere system require much further consideration and more reliable detail before any conclusion on the net effect of Man’s activities are possible….There seems to be a tendency at present to put too much emphasis on the likelihood of climatic changes resulting from human activity and to underrate the probability of natural climatic changes. This has clearly happened in the last 25 years, when warming was generally expected to increase and to accelerate because of Man’s production of CO2 whereas in fact there has been a net cooling, which is likely to be at least partly of natural origin. from Climate: Present, Past and Future, Volume 2 1977. 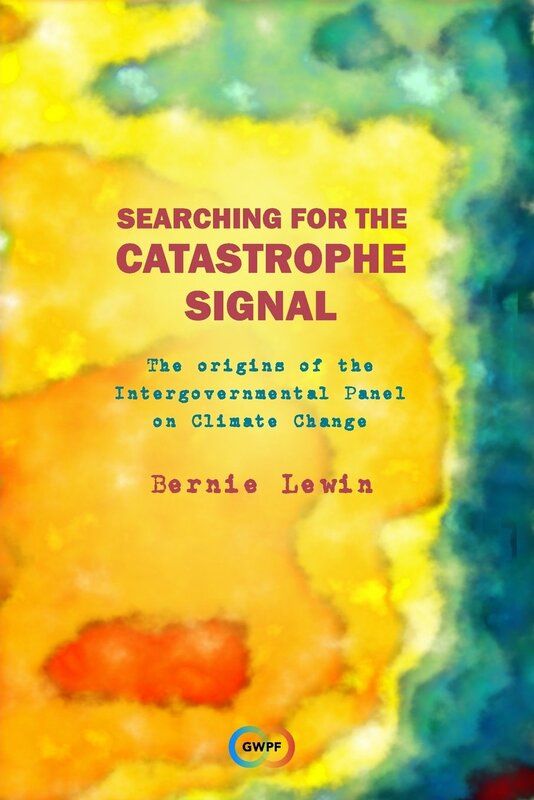 This second volume of Lamb’s magnum opus, published just before his retirement from CRU, is a comprehensive study of global climatic change and its causes. In it Lamb addresses the proposal of the late 19th century that depletion of carbon dioxide in the atmosphere could be sufficient to trigger ice ages. This passage is relevant here not only because it was with this hypothesis that in the 19th century man-made warming was first considered. It is more that the idea that CO2 variation has controlled global temperature in the geological past has been revived by global warming alarmists. It used to be thought that the amount of carbon dioxide in the atmosphere had fluctuated widely during the Earth’s history, warming the global climate through its ‘greenhouse effect’ as it increased and thereby provoking a luxuriant plant life, which ultimately reduced the CO2 to the recent level (i.e. before the industrial era) by fixation of the carbon in the plant tissues. It was realized that the slow production of limestone on the ocean bed also contributes to the removal of carbon dioxide from the atmosphere. These ideas were produced about the turn of the century (Arrhenius 1896, Chamberlain 1899) to explain the apparent global warmth of the Carboniferous period—the coal measures of that period being mostly the product apparently of a type of tropical rain-forest, tree ferns, often with giant leaf fans and no growth rings. But the distribution of Carboniferous climates is now understood in terms of continental drift. It was also thought that glacial climates might be explained by periods when the Earth’s atmosphere had become poor in carbon dioxide. There is no doubt that carbon fixation by plants, exchanges between the atmosphere and the ocean (CO2 being released to the atmosphere when the ocean becomes warmer) and fixation at the ocean bed in carbonates, regulate the amount of carbon dioxide in the atmosphere; but, for this very reason, it is probable that the fluctuation of global total (before Man’s intervention in modern times) were within much narrower limits than was suggested by those who would press this as causing great variations of climate in the geological past. Since about 1950 many studies have been undertaken, and a great variety of evidence has been presented, showing that modern Man-made modifications of the environment may affect climate not only locally but also on a regional, or even global, scale. The observed variations of average temperature over the world since 1880 have sometimes been interpreted as Man-made effects, despite the fact that similar—and also greater—variations occurred before the industrial era, attributable only to natural influences such as we have discussed in this book. Several recent reports (e.g. WMO 1972, NAS 1975) have concluded that Man-made effects on regional or world climate may now be just detectable, but must be expected to wax in importance, even allowing for the buffering and damping influence of the oceans with their great storage capacity for carbon dioxide and for heat, etc. From its radiation absorption properties it is certain that the most direct effect of increasing carbon dioxide in the atmosphere is to raise the temperature, but assessments of the amount of the temperature rise that should be expected from a given CO2 increase differ. One of the most widely accepted results of the use of mathematical models of the atmosphere has been the computation by Manabe and Wetherald (1967) of the effects of introducing increasing amounts of carbon dioxide into the atmosphere, using a model in which not only the radiation exchanges within the atmosphere but also changes in the convective activity were taken into account. Relative humidity and the amount of cloud cover were assumed constant. This model indicated that doubling the carbon dioxide content would raise the equilibrium temperature at the surface of the Earth by 1.9oC (earlier, it had been suggested that doubling the CO2 would raise the global mean surface temperature by 3.6oC, and that the increase of this gas since the industrial revolution might account for the whole of the 20th century waring of world climates). However, as noted in Volume I, water vapour is an effective absorber of most of the same wave lengths which CO2 absorbs; and Budyko (1974) cites work of Kondratiev and Niilisk (1963) which suggests from consideration of the effect of the atmospheric water vapour on the absorption of long-wave radiation that the changes which have occurred in the amount of CO2 in the atmosphere may have had only a small effect on temperature. The complexity and uncertainties that remain in this matter are underlined by a suggestion of Siemerling (1974) that the increase of carbon dioxide that has resulted in the sea, by increasing the acidity of the water, causes some of the calcium compounds and other plant nutrients which would otherwise settle to the ocean bed to dissolve. Hence, it is alleged, that phytoplankton populations are becoming denser, increasing the albedo of the ocean surface and thereby tending to cool the water. On balance, the effect of increased carbon dioxide on climate is almost certainly in the direction of warming but is probably much smaller than the estimates which have commonly been accepted. This is followed by a discussion of man-made aerosol effects including a discussion of Rasool and Schneider (1971), which hypotheses a dramatic cooling effect. The final section discusses the effect of Man’s direct output of heat mostly due to energy production. The various ways in which man has polluted the atmosphere and disturbed the environment so far have probably not individually affected the general level of prevailing world temperature by more that 0.1 or 0.2oC. Because some tend towards warming, others towards cooling the Earth, their overall effect on world temperature has probably been very small, though anxiety about continuing carbon dioxide increase continues. Complementary to these conclusions, a theoretical modelling study by Schneider and Mass (Science, vol190 p741, 1975) gives fresh ground for believing that the observed changes of global average surface temperature from 1880 to 1970 could be rather well explained by the combined effects of volcanic activity and solar variations. These items therefore demand further study and continuous monitoring. Chapter 20 discusses approaches to the problem of forecasting and refers to an appendix which annotates a list of known climatic forecasts as considered by the WMO Working Group on Climatic Fluctuations. Right at the end of the chapter is a curious footnote referring to the work of another WMO committee, the Panel of Experts on Climatic Change. This committee was chaired by the Australian W J Gibbs and included representatives from UNESCO, UNEP, ICSU, with Bert Bolin, representing GARP. Lamb was not a member. This “WMO Statement on Climatic Change.” can be found here: WMO Bulletin 25, no. 3 (1976): 211–12. There have been various other estimates of the warming of the world climate to be expected from a doubling of the atmospheric carbon dioxide, since the case was first thoroughly argued through from physical principles by G N Plass in the 1950s. Plass suggested a figure of 3.6oC temperature rise for a doubling of the CO2 and a 3.8oC fall if the CO2 were halved: on this basis it seemed that the entire warming of world climate (by about 1oC) since the industrial revolution in the 18th and 19th centuries might be explained in this way. The CO2 warming thesis has always had a specially strong appeal to physical meteorologists as one element in the complete problems of atmospheric science which should be entirely predictable, since the effects of CO2 on radiation are clearly demonstrable and well understood in theory. Nevertheless little was heard about the thesis in the 1960s, when it was discovered that world temperature was falling despite the more rapid increase of CO2 in the atmosphere than ever before. Others professionally concerned with the CO2 problem suggested that the warming effect might be no more than 1/10 to 1/15 of Plass’s figure; but recent studies with the most sophisticated models, which not only allow for atmospheric transport of the CO2 and heat about the world but take at least some formal account of exchanges with the top layer of the ocean and possible effects on cloud cover, have pointed once more to a greater warming, between 2.0 and 3.5oC, for a doubling of the atmospheric carbon dioxide to 600 ppm [reference to the ‘Charney report’ NAS, 1979]. These figures imply a steeper curve than that shown here in fig. 114; but they continue to be treated with scepticism by some climatologists and atmospheric modellers, because it has not yet been possible to include in a realistic dynamical way in the theoretical models the exchanges with the ocean (and to deeper layers within the ocean) or the effects on cloud and atmospheric humidity. It is pointed out that a 1% increase in mean cloudiness over the Earth, if such an increase occurred, would probably completely counteract the proposed CO2 warming effect—at least as regards the net effect over the globe. Such an increase of cloud might come about through a real warming of the ocean surface in low latitudes, leading to increased evaporation and input of moisture into the atmosphere, and hence more cloud over middle latitudes, producing lower temperatures than before there. The reason most commonly advanced for why the carbon dioxide, or combined greenhouse effect, warming is not obvious at the present time is that it is not yet big enough to go beyond the range of the climatic fluctuations—sometimes, of course, in the opposite direction—produced by natural causes. This range of natural climatic fluctuation is sometimes described as the ‘noise level’, which must of course make it difficult to identify any new trend—whether or not the trend were produced by man’s impact—before it had already reached a substantial amplitude. Efforts have therefore been made to decide how soon the (assumed) further increase of carbon dioxide will produce a warming too strong to be offset or obscured by the natural variability of climate. In such writing the natural variability is dismissed as unforecastable and therefore to be treated as random. Those putting forward this view of the matter have taken +/-1 oC as the approximate range of variation of the long-term temperature average produced by natural causes in the post-glacial world. In consequence of this, they expect the warming by carbon dioxide, combined with the other substances contributing to an intensification of the greenhouse effect, to gain the upper hand and ‘swamp’ all other elements of climatic variation from the end of this century onwards and possibly from the 1980s on. This view was strongly put in a statement approved by the executive committee of the WMO in 1976 (reported in The Times, London 22 June 1976). There is a fallacy in this part of the case, however, since it is impossible to define a figure for the range of natural variation of climate which is meaningful in this connection. The record of prevailing temperature, whether over the past few centuries or over the much longer-term record of ice ages and interglacial periods, shows that the range of variation is itself subject to variation. We know, both from early thermometer records and from the indirect indication of tree ring sequences in Europe, that in the Little Ice Age climate, specifically in its later stages for some decades around AD 1700 and again between 1760 and 1850 or later, the year-to-year variability (measured by the standard deviation) of these items was from 30 to 60% greater than the 20th century. There are similar indications from the European tree ring studies regarding the last decades of the warmer climate of the high Middle Ages between AD 1280 and 1350. And it is clear from isotope studies of the Greenland ice and other evidence that some much sharper changes took place in the later part of the last warm interglacial period. One surely implausible suggestion that has been put forward on the basis of serious scientific arguments is that the undoubted strong warming that has taken place in high southern latitudes, south of about 45oS, between the 1950s and 1970s (amounting to rather more than 1oC in the overall average for the Antarctic south of 60oS) may be the first direct sign heralding the dominance of carbon dioxide warming. The argument that the effect should be first noticed there, so far from all the man-made carbon dioxide sources, depends partly on heat storage and transfer by the oceans and partly on the freedom of high southern latitudes from the (increasing) contamination of the lower atmosphere by dust. The authors of this suggestion take no cognizance of the evidence that high southern latitudes have a record of a partly antiphase relationship to the temperature variations affecting the rest of the world and enjoyed somewhat milder conditions during some of the sharpest phases of the recent Little Ice Age. We shall return to some consideration of the distribution of temperature changes over the world, and their climatic consequences, in the next chapter. There are other serious enigmas and difficulties which remain to be sorted out before we can be sure that the thermal effect of increasing carbon dioxide on the passage of radiation of different wave-lengths through the atmosphere, which appears straightforward in theory, should emerge clearly in the complexity of the world environment. The effects involved in the oceans, and in the atmospheric moisture content and cloudiness, need further observation and study. And proper allowance needs to be made for the reactions of the biosphere, since vegetation (including the plant life in the sea) growing more luxuriantly in a carbon-rich atmosphere may change colour sufficiently to affect the reflection and absorption of solar radiation. It can be deduced that there was a much bigger change of the atmosphere’s CO2 content far back in the geological past between the conditions before the development of the first vegetation cover and afterwards, but neither in this case nor with the later changes of vegetation extent does there seem to be the expected correlation with the development of climatic changes. In theory the presumed changes of CO2 should have tended to stabilize the respective climatic regimes. During the long warm periods of geological time, when there was little or no polar ice, the oceans must have had a smaller capacity to hold carbon dioxide dissolved and so the atmosphere should have been richer in CO2. And during the ice ages the colder seas could dissolve so much more CO2 that its proportion in the atmosphere may have been much reduced. A figure of 200 ppm has been suggested for the time of the ice age climax. Contrary effects would, however, be implied by the changes of vegetation extent between warm periods and ice ages. In a preliminary draft of their work the authors of the equation added a caution, which could apply equally to much more elaborate theoretical modelling work: ‘We hesitate to try to improve the fit of our calculations to the observation by “tuning” the model…With so many free parameters to vary one could fit almost anything to anything…’ They also punctiliously added that they had played down the computation performed of a correlation coefficient between their results and the four hundred year record of global surface temperatures used because of uncertainty about the reliability of that record. The findings of Dansgaard and Hammer, and of Bryson and his co-workers, reported earlier in this chapter seem to reinforce the lesson of Schneider’s experience and suggest that the effect of volcanic matter in the stratosphere in cooling the surface climate may bulk larger—and possibly a good deal larger—vis-à-vis the carbon dioxide warming effect than is commonly assumed today. In what follows we shall also assume—as is common practice, though seldom specifically said—that the solution to the riddle of the lack of any demonstrable effect from the increase of carbon dioxide so far is that the expected warming has been offset by tendencies of the natural climate working in the opposite direction. It is agreed by most of those actively engaged in climate modelling that the main threat from human activities to the stability of the existing natural climate regime, to which our present-day international order is adapted, is the warming—possible inconveniently large—to be expected from the continuing increase of carbon dioxide. The range of model forecasts of the global warming response are discussed before Lamb uses a graph to compare them with indicators of the actual global temperature trend. Fig. 120 shows the range of various publicized forecasts of world temperature change based on the carbon dioxide warming effect resulting from different assumed future policies. To put the prospect in perspective against the net outcome when natural climatic variations are also included, what is known in outline of the history of world temperature from the 17th century to date is indicated by the most widely accepted variations of five-year mean temperature level in central England and over the northern hemisphere (the latter available only since 1870). This makes it obvious that the CO2 climate theory is not doing very well as the sole explanation of the changes and that other causes of climatic variation are also important. The common decision to treat the natural climatic variations as unforecastable ‘noise’ (i.e. random events) is plainly not satisfactory. Research effort must be continued, aimed at improving our capacity to foresee the variations of the natural climate. Nevertheless, widely publicized expert opinion from the leading theoretical modelling laboratories in climatic research expects the increase of CO2 to have raised world temperature by between 1 and 2oC by the period AD 2050-2100 in the case of the most restrictive strategies on fossil fuel consumption and by from 4 to 9oC on the basis of what are thought to be likelier developments. These figures may even be increased by the contribution from other pollutants. The expected temperature changes have been widely announced in an ever-increasing volume of meteorological literature, notably at the World Climate Conference organized by the WMO in February 1979 and at other scientific conferences before and since. The alarm that has been raised over the dislocation which such great changes would be liable to cause is entirely proper, even though the actual net outcome when the natural climatic variations also have their effect (and even our view of the CO2 effect, itself when the theoretical modelling has been improved) is by no means certain. There is not much time to acquire the necessary further knowledge to resolve the question and only too little time to adapt national and international habits and policy in the use of energy to minimize the dangers ahead—especially since some radical changes may be called for. The dilemma is a very difficult one. Despite the uncertain reputation of even short-term weather forecasts, and the uncertainties involved in this rather different problem, the potential for disorganization and disaster is so great that the meteorologists’ warning must be taken as a very serious matter. To conclude this chapter, we must return once again to an attempt to see the matter whole: the possibility of global warming, even drastic warming with dislocation of other elements of the climate pattern as a consequence, has to be balanced against the possibility of cooling, even drastic cooling, as the natural climate develops over the same period. Neither side of the balance is yet adequately known and understood. The effect of CO2 increase itself, although clear in the laboratory and in theory, is not proven as applicable in the global environment context where feedback (i.e. consequential) effects operating through the oceans and water vapour in the atmosphere may greatly alter the outcome. Nor is the net effect of the global increase of turbidity (particulate matter) in the atmosphere as yet certain, since (a) the sizes and distribution of the suspended particles in the world atmosphere may make the difference between a net warming and a net cooling effect, and (b) in this matter also complications may arise through some of the substances facilitating the condensation of water vapour to form clouds. All forecasts must in any case be subject to the proviso that volcanic activity does not produce so much aerosol in the atmosphere as to impose cooling, as may indeed have been happening since 1950. So there are many reasons for scepticism about the confident forecasts based on present theoretical models, even though their warnings of what may happen must be taken so seriously as to guide policy decision which have to be taken very early if the dangers are to be averted. from ‘The Future of the Earth – Greenhouse or Refrigerator?’ Journal of Meteorology 9, (1984) p237-242. This paper was presented at the opening of the first session of the meeting of the British Association, Section A (Physics), at Norwich on 11 September 1984. See also below extracts from the later version of this paper as the concluding chapter of Weather, Climate and Human Affairs, 1988. What we are going to discuss today really involves the while complex of influences under which climate continually varies and the balance at any one time between the effect of things attributable to human activity and those of natural origin. If we are to gain some perspective, we must simplify; but let us not forget that the fully tally of influences affecting climate is big and that many interactions and feedbacks occur. We are all aware of how greatly mankind has altered the face of the Earth, notably by destroying the natural forest belt of middle latitudes over the last 5,000 years (but especially in the last 100 to 150) to make way for agriculture. And now the equatorial rain forest is fast going the same way. And it may be that this, or just Man’s vanity, in some cases leads us to suppose that our influence on the climate is greater than it really is. Lamb then introduces the background of natural climate fluctuations and changes and their possible causes before returning again to the human influence by consideration of the natural greenhouse effect. It seems therefore that increasing the carbon dioxide in the Earth’s atmosphere—the end-product of all our burning of fossil fuels and of vegetation—should raise the world’s temperature, although the effect may be smaller, perhaps very much smaller, than is usually supposed. Budyko (1982) has sought to demonstrate that the main course of history of the Earth’s climate through geological ages can be explained by the variations in the carbon dioxide content of the atmosphere. But not all geologists agree that the record fits so well. It seems to be established that the carbon dioxide concentration was much reduced in the last glaciation (this from analysis of the gas in bubbles in the ice which is still present in Greenland). But it is clear beyond any doubt that there are other influences which also change climate and which were deeply involved in the last glaciation in particular. (The Earth’s orbital changes and volcanic dust can both be specified in this case). So, one must be suspicious of attempts to explain all the major turns of the Earth’s temperature history in terms of just one variable such as carbon dioxide alone. Sometimes, the whole rise of world temperature in recent centuries (indicated by receding glaciers as well as available thermometer records) since the industrial revolution has been, perhaps more plausible, attributed to the increase of carbon dioxide. However, even this case seems more than doubtful when we examine the longest actual thermometer records. The great oscillation of the prevailing temperature level amounting to almost 1.5 degrees in the 10-year means, that affected much of Europe, as well as Iceland, and perhaps wider regions of the world, between about 1690 and 1740 (fig 1 [fig 120, or in 1982 above])—by far the greatest change in the record—cannot be explained by carbon dioxide changes or any human agency. It may be, but cannot be proved, that changes in the amount of volcanic activity or a fluctuation of the Sun were the dominant influences. Whatever models we produce must express a balance between the influences at work and their possible interactions. Changes that menace the entire world economy may be before us. It behoves us to do our utmost to monitor and understand them. But we must also be modest about our capacity to predict them. Our models serve rather to warn us about what could happen concerning what seems, to our best endeavours at understanding, to be the logical consequence of our actions or of observed tendencies in the climate interpreted according to the well-known laws of physics. from Climate History and the Future, a paperback edition of Climate: Present, Past and Future vol 2 re-issued in the USA in 1985. This text comes from ‘Preface to the Paperback Edition,’ xxxi and xxxii, dated Oct, 1984. Since this work was published in 1977, the vulnerability of our increasingly populated world to climatic shifts and extremes has repeatedly claimed international attention…Concern has also gripped the scientific community over the possibility that Man’s pollution of the atmosphere, especially by the increase of carbon dioxide and the nitrogen oxides produced by fertilizers, could soon have big effects on world climate—supposedly a drastic warming overall and a poleward shift of the rainbelts and desert zones, undermining established patterns of crop production and thereby the world economy. All this has led to a tremendous increase of effort in climatic research at a time of funding cutbacks in many other branches of science. * International agreement was achieved in 1979 for a world Climate Programme, to extend over many years under the guidance of the WMO and the UNEP. Within its framework various countries, and the European Community, have inaugurated their own climatic research programmes. from Weather Climate and Human Affairs a collection of previously published papers, often substantially updated. It is, and is likely to remain, a difficult matter to verify how the computed climatic results of modelling theoretical circumstances—such as doubling the atmosphere’s carbon dioxide content, or a world without forests—would correspond to reality. To have a basis of reality for our thinking about these problems, it is essential to reconstruct—in whatever detail is possible—the part record of climate, world-wide. We need to know the range of climate’s observed behaviour since prehistoric times, when the world’s surface looked somewhat different, and the various regimes that have occurred. We should then be able to test the ability of the theoretical models to explain at least what has actually occurred. Periods in the past when, as we already know, great climatic changes took place surprisingly quickly deserve particular attention, for the record shows that climate can appear stable over long periods and then undergo rapid change. Reconstruction studies are much less costly than theoretical modelling…The simple work on reconstruction of the actual past record still tends to be starved of funds in many countries, though it is vitally needed if the more obviously exciting theoretical work on modelling the future is to be at least partly authenticated. The commonest assumption still seems to be that the climate will soon get back to ‘normal’ or that, if any irreversible change has taken place, it must be somebody’s fault, attributable to human actions in some form. Opinions about the effectiveness of various external influences including of the intrusions of human activity, upon climatic development remain in most cases controversial, since assessments vary. Issues which are at present the subject of live, and on the whole inconclusive, debate include the likely effect of: the global increase of carbon dioxide in the atmosphere…In some of these matters, and in the supposed climatic effects of nuclear war, political pressures show signs of further complicating the position. Money to fund research may be more or less readily forthcoming according to what the results appear (or are expected) to indicate. This irrelevant influence—to which all countries seem liable in only varying degrees—may be backed by powerful interests and threatens to cloud the possibilities of scientific understanding. Observation further suggests that personalities sometimes have a good deal to do with the incidence and removal of this kind of barrier to scientific advance and that, even within one country, the difficulties may differ from one branch of science to another and from one generation to another. But neither political ulterior motives nor the abuse of power by individuals is the whole story. There are also fashions in scientific work, whereby some theory catches on and gains a wide following, and while that situation reigns, most workers aim their efforts to following the logic of the theory and its applications, and tend to be oblivious to things that do not quite fit. The swings of fashion among meteorological and climatic research leaders over the carbon dioxide effect provide an extreme example. The suggested carbon dioxide effect of an inevitable warming of world climate was more or less strongly held between 1938, when it was clearly argued by Callendar, and 1960, after further contributions by Plass (1956), only to lose ground in the years when it was obvious that the climate in the northern hemisphere was getting colder (despite greater output of synthetic carbon dioxide than ever before) from the late 1950s till about 1974. The theory then rose to renewed dominance around 1980. Between 1975 and 1980 the northern hemisphere cooling leveled off, or possibly reversed, and it became known that there had been a significant warming in New Zealand and the Antarctic without interruption over several decades. This is a very serious matter because if the claims for the carbon dioxide effect could be substantiated, the commonly estimated warming of the average global temperatures by about 2oC with a doubling of carbon dioxide in the atmosphere in the next century would be expected to move the climatic belts poleward by three to five degrees of latitude….The economic consequences for agriculture and international trade would be severe and might prove a potent cause of tension between nations. However, the proposed effect cannot so far be demonstrated, perhaps because it cannot be clearly disentangled from the continual variations of climate due to natural causes…Despite many assertions in the literature of recent years, it is not yet possible to estimate convincingly a limit to the range or the rapidity of natural variations in climate. The cooling was worldwide. (Associations with changes in the amount of radioactive carbon in the Earth’s atmosphere suggest a solar origin.) Some of its effects included the dying out of the Norse colony in Greenland, unrest in the Highlands of Scotland, retreat of the agricultural peoples who had been spreading up the Mississippi River Valley in North America, and the abandoning of the cultivation of oranges in the Kwangsi Province of China. There was a similar southward shift of the limit of vineyard cultivation in Europe. The Southern Hemisphere was similarly affected. The cooling trend was reversed about 1700, and apart from the setback that followed the remarkable warmth of the 1730s and some smaller fluctuations in the 19th century, the history of the climate from the time when thermometers came into use until the 1940s was a one-way trend towards ever increasing warmth. The warmth became much stronger about 1900. In the Arctic, where it was strongest of all and caused a reduction of about 10% in the extent of sea-ice, the greatest warming took place after 1920. The climatic change in the first half of the 20th century could well be described as a general improvement of world climates because, in addition to the increasing warmth, significantly more rainfall was reaching the continental interiors (except the US Middle West), the summer rains extended farther north into the southern fringe of the Sahara, and the Indian monsoon rarely failed. These aspects seem to have been linked with general intensification of the global wind circulation. They certainly eased the problem of producing enough food for the world’s increasing population. The coincidence of the latest period of general warming of world climate with the industrial revolution and of the more intense warming with the industrial growth earlier in the present century led to the suggestion that the warming was due to artificial production of carbon dioxide. Since the 1890s there has been a 10-15% increase in the atmosphere of the proportion of this gas, which acts as a trap for the Earth’s outgoing radiation. But since 1945-50 the global average temperature has fallen again somewhat, despite an even greater production of carbon dioxide by human activity. This suggests a natural climatic fluctuation that is strong enough to outweigh the effect of the increasing amount of carbon dioxide. With better knowledge of the past record of climate, it may become possible to identify the nature of this most recent fluctuation or the entire series of cyclic changes to which it belongs. The increasing scale of human activity and the variety of ways it pollutes the atmosphere are causing anxiety, not least because of its possible effects on local and, ultimately, on global climate…. Despite these anxieties, however, it appears that at the present time natural fluctuations are still the dominant element in the Earth’s climatic changes. It is important, therefore, that research should also be devoted to improving knowledge of the past record of climate and gaining better understanding of these natural changes….Every year ‘climatic diagnostics’ discussion meetings are held, and efforts are devoted to detecting the causes and mechanisms of whatever changes are observed. Particular emphasis is laid on detecting any possibility of identifying effects attributable to human activities. However, if we are to be able to detect human disturbance on the natural regime of the climate, we must gain the fullest possible knowledge and understanding of the natural behaviour of climate. And that must be seen at its best in times and circumstances before any effects of human actions could be significant—hence the need to reconstruct the past. Improving the reliability and completeness of the theoretical models will be a long process. The most fundamental need, however, in the quest for climatic—and even for seasonal—forecasts is for improvement of the observational base of the subject. Our knowledge of the most basic facts of the mechanisms of climate, let alone of the long record of its behaviour and the multiplicity of influences upon it, is still insufficient. He then gives examples of dramatic changes in the estimation of global albedo, of global snow and ice cover, and of remaining unknown quantities such as measures of precipitation over oceans. The final chapter is ‘Chapter 18: The future of the earth: Greenhouse or refrigerator?’ This is a substantially expanded and updated version of the same titled work published in 1984 in Journal of Meteorology, Vol9, #92, from which we quote above. The paper was originally delivered 11 September 1984 to a meeting of the British Association for the Advancement of Science at Norwich. A manuscript version is listed in the catalog of the UEA H H Lamb Archive, Box 2. The section of Chapter 18 titled ‘Carbon dioxide’ opens with Lamb noting that ‘the effect of increasing the carbon dioxide in the atmosphere…seems at first sight to be as straightforward and grounded in well-understood physics, as those of volcanic dust and aerosol and the products of nuclear war.‘ However, Lamb explains, various complications make the overall effect more difficult to predict. The precise effect of the carbon dioxide, and particularly of increasing the carbon dioxide, in the atmosphere cannot be fully resolved by theoretical modelling because of the complexity of the exchanges between the atmosphere, ocean and ocean-bed, and the biosphere, and the secondary effects of changes in cloudiness. It is agreed that the last-named may be very important, not least because of the possible latitude distribution of the changes…It seems therefore, that increasing the carbon dioxide in the Earth’s atmosphere—the end-product of all our burning of fossil fuels and of vegetation—should raise the world’s temperature, although the effect may be smaller, perhaps very much smaller, than usually supposed. This is followed by a brief discussion of the various estimates of climate sensitivity to a doubling of CO2, which ranging from 0 to 11 degrees. Lamb then discusses ‘some disturbing evidence‘ of unexplained variability of CO2 levels before the Industrial Revolution and back through the last two millennia. This is followed by Lamb raising concerns about external influences on science practice, confirmation bias and the ‘arbitrary element‘ introduced when primary data requires adjustment. …there are also signs that the eager search in many laboratories for verification of the expected carbon dioxide caused warming of the climates may have been pressed too hard. There is danger in the situation where scientific research is richly funded by interested parties—parties, for instance, whose own support may be affected by the outcome of the coal vs. nuclear fuel debate and all those other debates surrounding the future of nuclear technologies. The most dispassionate among the informed commentators agree that it is not possible to show any conclusive evidence yet for carbon dioxide warming. Indeed, the growth of the Alpine glaciers, the predominance of cold over warm extremes in North America and Europe during the years of remarkable variability of climate since 1975, the occurrences of snow and killing frosts in low latitudes both north and south of the equator, the continued colder regime in Iceland and shorter frost-free seasons in Canada and northern Europe, and the continuance of temperatures in England averaging below the earlier 20th century all seem to be preferentially overlooked. There is unfortunately room for error and misjudgement in the preparation of temperature series which attempt to present averages and trends for the whole Earth, a whole hemisphere or even a whole latitude zone. A large number of temperature-observing stations on land are increasingly affected by artificial sources of heat, particularly from urban growth, as first surveyed by Dronia (1967) and again drawn to attention in work drafted by Professor K E F Watt of the University of California at Davis (personal communication, 13 Feb 1985). Similarly, many sea-temperature measurements are now made in the engine intakes of ever bigger ships. And temperature derived by sensing from satellites have their margins of error. Efforts have, of course, been made to adjust for and eliminate these sources of error. But this introduces an arbitrary element, and it may still be open to question how far such adjustments have been correct. Some of the resulting temperature series are hard to reconcile with the indications we have noted of a continuing colder climate than that before 1960, at least in the northern hemisphere. There is no doubt, however, about the warming over the last 50 years in the Antarctic, and since about 1950 in New Zealand. These changes seem to be comparable with the warming of the Arctic between about 1910 and 1945. Schneider and Mass (1975) showed that the changes of global, or at least northern hemisphere (of which we are surer), surface temperature from 1880 to 1970 could be rather well explained by indices representing the changes of volcanic matter and carbon dioxide in the atmosphere (counteracting each other), together with a much smaller effect of varying solar activity. Studies by Gilliland (1982), attempting to sort out by several different proposed model constructions what combinations of any two of these variables may best fit the observed changes of northern hemisphere temperature between 1881 and 1975, are also interesting. They support the conclusion that all three variables play a part and suggest that perhaps also the lunar nodal cycle of 18.6 years, which affects the tidal force, may be important. Budyko (1982) sought to demonstrate that the main course of the Earth’s climate through geological ages can be explained by the variations in the carbon dioxide amount in the atmosphere. But not all geologists are agreed that the record fits so well. It seems to be established from analysis of the gas in bubbles trapped in the ice of the Greenland ice-cap that the atmospheric carbon dioxide content was much reduced during the last ice age, probably to about 190 to 200 parts per million. This change must have been at least partly a consequence of the cold climate, because of the great solubility of CO2 in the colder seas of that time. It is clear beyond any doubt that there are other influences which also cause the climate to change and which were deeply involved in the last ice age in particular, and in the earlier glaciations in the current (Quaternary) geological period. The Earth’s orbital variation can be named with confidence in this connection through the ice ages and interglacials of the last 400,000 years. So one must be more than suspicious of all attempts to explain all the major turns of the Earth’s temperature history in terms of just one variable, whether carbon dioxide or volcanic veils or any other, or to present it as overriding all other effects. Our discussion above makes that very clear in the case of the last 500 years. Nevertheless, attempts have been made to present the whole rise of world temperature since the Industrial Revolution, from the 18th to the 20th century, as attributable to the increase of carbon dioxide, and this is still often implied in current discussions. Schonwiese’s analysis shows that this is unwarranted. If we take the long record of temperature prevailing in central England since 1659 (Manley 1974) as reasonably representative of the changes that have affected much of Europe (see Ch 4 in this book), and probably a much wider area of the northern hemisphere (see Ch 11), a great oscillation of the general temperature level amounting to almost 1.5oC in the 10-year averages is seen between about 1659 and 1730 (fig 18.2 [see this fig.]) This is by far the greatest fluctuation in the course of the instrumental record. It is seen also—though rather less sharply—in the northern hemisphere temperatures reconstructued from the Greenland ice record (Groveman and Landsberg 1979) here reproduced as figure 18.3 [see original], but in Greenland it seems to have been surpassed by the change (warming) from 1810-16 to the late 1820s and the preceding cooling from the 1760s to 1810-16. These rapid changes certainly cannot be accounted for by carbon dioxide variations or any intrusion originating in the human economy. The 1690s-1730 warming spans the end of the Maunder minimum of solar disturbance. And the 1760-1830 period saw very big variations in the amount of volcanic material in the atmosphere as well as some of the biggest sunspot activity variations in the record. There is an acknowledged possibility that there was also much greater volcanic activity in and around the 1690s than our chronologies reveal, owing to possible underestimation of a succession of great volcanic eruptions known to have occurred in low latitudes in the East Indies, as well as the 1693 eruption of Hekla in Iceland. So it seems likely that both these great fluctuations in the temperature record were caused by a combination of short-term, but drastic, swings in the volcanic aerosol production and in the solar energy itself. Of the external influences on climate which seem to have been significant in the record of past climate, these are the two—volcanic activity and fluctuations of the sun—which are liable to the most rapid changes. It seems reasonable to suppose that it is their changes, superimposed on the slower, progressive changes in the radiation available because of the Earth’s orbital cycles (and the still slower effects of drifting continents changing the geography), that have caused most of the rapid changes of climate traceable in the past. It may be worth recalling in passing that the great rise of northern hemisphere temperatures between about 1900 and 1940, which accompanied the increasing sunspot activity up to the 1957 cycle, has been frequently attributed to the increasing carbon dioxide in the atmosphere. The CO2 increase accelerated after 1950-60, just when the northern hemisphere temperatures were falling. The quiescence of the volcanoes from 1912 to about 1960 was also a feature of the marked warming period. The warming should, perhaps, be attributed more to these features of the period than to the increasing carbon dioxide. The great outburst of research activity in climatology since about 1960-1970 has given us a much more specific knowledge of the history of climate and of the things that cause climate to change, as well as revealing some of the impacts on the economy, on society and on the international order. But science is not yet in a position to make reliable climatic forecasts over many years ahead, apart from the near-certainty of development of the first stages of the next ice age around 3000-7000 years from now. Our understanding makes it fairly clear that the world-wide warmth of the 20th century in comparison with the immediately preceding centuries, should be attributed partly to carbon dioxide increase; but it seems that the roughly 50-year-long lull in volcanic activity in the northern hemisphere, which led to a clearer, more transparent atmosphere, also played an important part—it may have been the main part. Also the intensity of the sun’s beam, apparently in the course of the secular cycle and some still longer cyclical evolution, seems to have been greater during much of the first half of this century than in earlier years (or that it became in the years 1979-85). Analogy with the duration of previous interglacial warm climates, such as the present, has suggested to Woillard and others, especially botanists, that the Earth may now be at or close to the beginning of the final, cool-temperate stage of the present interglacial—a natural change perhaps sufficient to ‘swamp’ any climatic warming tendency from the products of human activity, whether over the next 200 or 2000 years. The global temperature graph derived from J Murray Mitchell that appeared in the first edition is compared with the graph of the same indicator given in the IPCC supplementary report of 1992. The land surface temperature data used for the IPCC graph are from Phil Jones of CRU. Some excerpts from the added discussion are below. In an addition to the second edition of Climate, History and the Modern World, Lamb compares the global temperature graphs after Mitchell, which appeared in the first edition, with and a new one from the IPCC Supplementary Report. It should plainly be desirable to update our portrayal in fig. 91a of the course of world-average temperature at the surface of the Earth, as indeed has been attempted in various quarters. The most authoritative version is due to the [IPCC]….The overall shape of this historical curve is the product of successive revisions adjusting the values for urban and industrial warming and any other possibly distorting influences at the observation sites…This writer is inclined to the belief that, however careful the observing procedures and however carefully studied the adjustments applied afterwards to the observations, to declare a value for the world average or an area average to within some hundredths of a degree centigrade is an unattainable ideal….The revised version…gives a disconcertingly different picture of the course of world temperature history that should not pass without notice. The difference…must be partly explained by the fact that [91a] omitted the Antarctic and all latitudes south of 60oS, where all our evidence makes clear that very substantially higher temperatures have been observed since about 1950, as is also true for New Zealand. The other main contribution to the discrepancy is the significant warming of the tropics….Despite the rapid rise of world temperature after 1975 indicated by our fig. 91b, there has been a noteworthy occurrence—seen, for example, in the Danish temperature record here reproduced in fig. 28a (p80) and in other records in North America and Europe of further cold events or some continued colder conditions until 1985 to 1987. The state of affairs at the time of writing (1994) seems to be that, after truly exceptional warmth in the years 1989-91, there has been some fall of temperature world-wide, which has been attributed by many to the effects of the great volcanic eruption of Mount Pinatubo in the Philippines in June 1991. Prospects of global warming are now spoken of on every side and are treated by many, including people whose decisions affect millions, as if the more alarming forecasts were already established as fact. It now seems necessary to admit—though this is seldom mentioned in recent literature—that none of these variations explains the timing of the general warming and cooling phases altogether satisfactorily, certainly not as well as widely claimed. In particular, the onset of the sharp warming phase around 1700, and the mid-20th-century cooling from about the 1940s to the early 1980s, are not well accounted for. Nor is the magnitude, nor the distribution, of warming and cooling over the Earth in good agreement with most global warming model predictions. Even the great warmth of the year 1989-91, hailed in some quarters as proof of the reality of the predicted global warming due to the enhancement of the greenhouse effect by increasing carbon dioxide and other effluents, requires the usual adjustments. But it may also have a surprising analogy in the past to the remarkable warmth—well attested in Europe—of the year 1540, shortly before the sharpest onset of the so-called Little Ice Age. The carbon dioxide in the atmosphere is the basic food of vegetation, which may be expected to grow more luxuriantly in a more carbon-rich environment. If climates get warmer, it should benefit from that too…Much research published in recent years has been directed at anticipating the increased crop yields that might be expected in a warmer world and the possibilities which might open up of growing warmth-demanding crops in new areas. But against these advantages must be set the likely extended ranges of insect pests and diseases from warmer latitudes. However, the match between past periods of increasing CO2 and climatic warming seems not to be as close as expected and widely claimed. The semi-permanent centres of low pressure over the northern North Atalantic and northern North Pacific have shown this expected intensification. But there is doubt as to how far this can be due to global warming from the man-made increase of carbon dioxide and other ‘greenhouse gases’. Doubts arise because the geographic distribution of the warming differs markedly from model predictions. It is not as marked in the Arctic as in some other regions. And the prolonged cooling period between about the 1940s and 1975-80 or after coincided with a time when the increase of carbon dioxide, etc., was more rapid than ever before. Among the most serious gaps in our present understanding are the rapidity of some climatic changes and the timing and causation of some, seemingly abrupt, changes of climatic trend, including this recent cooling and the sudden return to warmth affecting the northern hemisphere since 1987-1988 (at latest). It is not sufficient to say that this is the ‘greenhouse effect’, the warming associated with the increasing carbon dioxide etc. in the atmosphere, which we have been expecting, unless we can say why it did not show in other, recent periods of years over large parts of the northern hemisphere. We can grant that there were some parts of the world where the ‘greenhouse’ warming did seem to be taking effect during those years: in particular, from some time around 1950 there was notable warming in New Zealand and over parts of the Antarctic. But in these areas too the sudden onset needs explaining, and they have not continued in the forefront of the warming tendency. Such step-like progress, now here and now there, seems to have characterized a number of past climatic warming and cooling episodes. Part of the explanation may lie in preferred wave-lengths in the flow of the upper westerly winds around each hemisphere combined with some degree of ‘anchoring’ of these features by a stubbornly warm or cold surface in one sector or another, or by a mountain barrier interfering with the wind-flow. In 1896 the Swedish scientist, Sv. Arrhenius, professor of physics first at Uppsala and later in Stockholm, published his suggestion that increasing the carbon dioxide in the atmosphere, as was already happening relentlessly, should be expected to warm world climates because of its absorption—i.e capture—of long-wave radiation that continually goes out from the Earth and so create a sort of ‘greenhouse effect’. And in 1938 in England G S Callendar seemed to show in a paper in the Royal Meteorological Society’s journal that the observed warming of surface temperatures over the Earth by about half a degree Celsius from around 1890 to the 1930s should be about right to be attributable to the radiation trapped in the atmosphere in this way. But there are some difficult points. Water vapour, which is abundant in the atmosphere except over the coldest regions of the Earth and in the stratosphere, also absorbs radiation and on almost all the same wave-lengths that the carbon dioxide absorbs. Difficulties, too, beset attempts to show how variations in the amounts of carbon dioxide in the atmosphere in the past fit the theory that warm periods in world climate can be attributed to a greater CO2 content and cold periods to a lower CO2 amount. The CO2 content at various past times is presumably indicated by the gas trapped in bubbles in ice-sheets and glaciers. This does show less CO2 in glacial times, and during warmer interglacial periods the CO2 amount were greater. But, since carbon dioxide is more soluble in water—in the oceans for example—when temperatures are lower, the smaller amounts of CO2 in the bubbles in the ice sheets in ice age times could be just a result of the colder climates then prevailing. And, even within our own times, the suggestion that the increasing carbon dioxide in the atmosphere should be presumed to be the cause of the warming does not fit at all well with the sequence of observed values. The great period of warming, at least in the northern hemisphere, was during the first 40 years of the 20th century (especially the first and fourth decades), but in the 1950s and 1960s when the CO2 was increasing more rapidly than ever before the prevailing temperatures were falling. Callendar himself was worried by this discrepancy and contacted both me and Professor Gordon Manley about it. There seem, in fact, to have been a number of shorter runs of sometimes up to 50 years with either rising or falling temperatures often setting in suddenly, and with no clear correspondence to changes in the atmospheric CO2 content. We also see that account must be taken of psychological reactions—even in the influential research community—to the variations towards greater or less warmth as and when they occur. In the 1880s and 1890s, as a recent American meteorological investigator was the first to be able to show, world temperatures were lower than they had been since around 1850. That was just when Arrhenius came out with his suggestion that the man-made increase of carbon dioxide should be warming the Earth. And at that time the suggestion made little impact. When Callendar promoted the same idea 40 years later, however, it was in a warmer world, though very soon the bitter war winters came and implanted themselves in folk’s memories. And when G N Plass again put forward the CO2 warming theory in papers published in 1954 and 1956, world climate was once more entering a colder phase, particularly in the northern hemisphere. Interest in the theory soon waned. It only revived after a run of up to 8 mild winters in a row affected much of Europe and parts of North America in the 1970s and 1980s. There then came a tremendous preponderance of publications on global warming, dominating the research literature, although over-all temperature averages in some regions, particularly in the Arctic, were still moving downward. So, in spite of the sharp turn towards warming after 1987-8, and the undeniably very warm years 1989-91 and 1995, one must feel uneasy about the confidence with which global warming has been publicised as the verdict of science in official pronouncements from many quarters. The erratic course of the changes experienced through the 20th century surely suggests that there are processes at work which are still not adequately understood and possibly even some influences that have not yet been identified. Around 1960, Professor M T Budyko of the USSR Academy of Sciences, and his colleagues in the Hydrological Institute in Leningrad and the Voeikov Main Geophysical Observatory there, were already greatly concerned with the changes that climate undergoes and the threat of increasing influence from human activities. They placed strong emphasis on inadvertent modifications—meaning, in general, warming—of the world climate through the increase of carbon dioxide in the atmosphere and from other gases released by human activities which add to the ‘greenhouse effect’ by similarly absorbing, and thereby checking, the outgoing radiation from the Earth. Budyko was reported to have suggested at a conference in Moscow in 1960 that it might soon become necessary for mankind to intervene in some ways to counter the development, possibly by using aircraft to spread veils of dust and smoke in the stratosphere, to reduce the strength of the incoming sun’s beam. So, after a long period in which the question of climatic variation was generally ignored, the subject was becoming a live one again and many international conferences were held from about 1960 onward to discuss it. Between the 18th and the mid-19th centuries a very different attitude had prevailed, owing to advances of the glaciers in many parts of the world and the occurrence of various kinds of extreme seasons. It was indeed the anxieties in that time, particularly among those whose land was being overrun by ice, reduced to swamp, or continually threatened by landslides or rock-falls, and elsewhere by sea floods or advances of coastal sand dunes, that had led to the first officially organized networks of post for regular meteorological observations being set up. Now, with no less than three world conferences on the subject which I was encouraged to attend in the one year 1961, the matter was returning to ‘centre of the stage’. He then recounts some aspects of these conferences during 1961 including the ‘bizarre backcloth’ to the first conference of persistent extreme cold weather. It is not likely that these conferences were called exclusively to address anthropogenic changes. Rather, Lamb’s point appears to be that that issue came to dominate the discussion of climatic change at these conferences. The first was in New York under the auspices of the New York Academy of Sciences and the American Meteorological Society. The second was the 4-yearly meeting the International Association for Quaternary Research (INQUA) in Poland. The third conference on this topic that Lamb was ‘encouraged to attend’ was a UNESCO ‘Symposium on Changes of Climate with special reference to arid zones’ [proceedings]. The regions reviewed included Kurdistan, Iran and Iraq, and Israel, the Ukraine, northern and southern Africa. And attention was given to the work of archaeologists from Soviet Asia, besides tree-ring workers’, and oceanographers’ and meteorologists’, work ranging from low latitudes to the Arctic. In the final session, the American meteorologist, Jerome Namias, commented that ‘these meetings will have been specially valuable for the theoreticians in bringing them up against the facts of climatic change, so tending to save them from continually floundering about in their ignorance’. But this is likely to prove an elusive hope because of the very different types of mind of research workers in these different realms. A high proportion of the theoreticians will presumably always prefer the tidy, beautiful patterns of theory to the complexities of the real world. And they may always prefer to dismiss various occasional and supposedly marginal influences—solar?, gravitational?, tidal forces?, fortuitous ice blockages?, and so on—which might spoil the regularity or the symmetry of their patterns. And the possibility remains of occasional disturbances even of the long-period astronomical rhythms of ice ages and the warm interglacial periods by sudden outflows of very great ice masses from the Antarctic continent. The history of incidents of blowing sand is paralleled by experiences all along the low-lying coasts of western and northern Europe from Biscay to the Arctic. The examples include encroachments of the sea by flooding and crumbling cliffs and others associated with recession of the sea due to silting, and blown sand. Others again are due to land-rise along northern coasts with continuing rebound of the Earth’s crust where it had been depressed by the great load of ice. It is unfortunate that studies produced nowadays treat these and other matters related to changes of climate as if they are always, and only, attributable to the activities of Man and side-effects on the climate. Since my retirement from the directorship of the Climatic Research Unit there have been changes there… My immediate successor, Professor Tom Wigley, was chiefly interested in the prospects of world climate being changed as a result of human activities,….After only a few years almost all the work on historical reconstruction of past climate and weather situations, which had first made the Unit well known, was abandoned. There was an exception in the case of tree-ring studies. Keith Briffa and his wife, Sarah Raper, took this up. Tom Wigley and his wife, Astrid Ogilvie, have continued their tree-ring work on northern Scandinavia and Finland, and the latter has continued her historical researches in Iceland. And the sense of being one community with shared hopes and responsibilities has withered and been almost killed by the scorn of the country’s leading politicians in the 1980s and since. This was perhaps the logical end-product of the class-war and industrial strife and had been growing and festering for some decades, until the scorn has become mutual; an in-built feature of Britain’s divided society, made worse by government policies that are widely seen to have been opening wider the gap between rich and poor, and the welfare state itself has been progressively distorted to give greater and greater advantages to those who can make independent financial provision for their health and old age and the education of their young. My personal experiences in Britain of the difficulties, amounting to near impossibility, of securing the funding that the newly established Climatic Research Unit required to sustain its life and support the fundamental studies on its programme opened my eyes to the vulnerability of new ventures to any sort of dictatorship, whether from a completely government-funded socialist state or from over-mighty individuals occupying strategic positions of power in a small to medium-sized country. It was the freedom offered by well-resourced independent bodies—ranging from wealthy individuals to research foundations—that made it possible for the Climatic Research Unit to survive. It was of course Thatcher who, towards the end of her final term, ended up injecting enormous government grants into British climatic research while other areas of scientific funding were suffering. Of Thatcher’s late conversion to global environmentalism, and her key role in building the international campaign for coordinated mitigation, we have yet to find any comment from Hubert Lamb. Many thanks. Very interesting. I have ordered both the first and second edition of Lamb’s book. He seems to have been a thoroughly pleasant and erudite chap. Many thanks for this. I have the second edition of Climate History and the Modern World, but have lost the First Edition, probably borrowed and not returned.